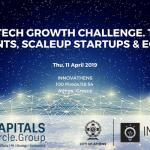 CAPITALS Circle Group in cooperation with Innovathens co-organize the 4th CCG Tech Dialogue Initiative in Greece focused on The Tech Growth Challenge forum. Tech Investments, ScaleUP Startups & Ecosystem. Participants will meet and get an insight of the topics discussed from Investors, Tech Startups, Tech corporates, policy makers and media, as well as senior speakers from Berlin Tech Ecosystem and Greece. A National Policy/Strategy for Digital Transformation, GR/Athens Digital Economy & Tech Ecosystem. Best Practices from other countries. How to achieve Digital Transformation of corporates, SMEs, ScaleUP the Tech Ecosystem & attract Tech Investments/Startups, achieve Tech Success Stories & Exits. Best practices from developed Tech Ecosystems. Kostas Champidis, Chief Technology Officer, City of Athens. Presentation of a Benchmark Analysis of London VS Berlin Vs Athens Tech Ecosystems by CAPITALS Circle Group. Third Thematic Field. The Digital Transformation Challenge cross-sectoral, Tech Investments, VC Fundraising, Partnerships with Tech Corporates, Scale a Tech Firm globally? The Investor Approach, VC – Startups Relations & the Deal process. Please contact us in case of interest for forum partnership/sponsorship under: pr@capitalscirclegroup.com or +6972897227 or +491636750858.